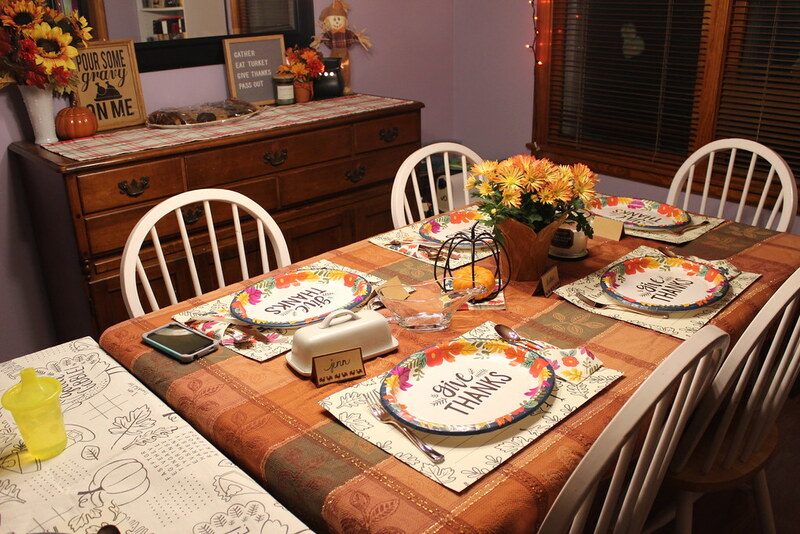 For years now (like 11 or 12 of them), I've been making many of the components of Thanksgiving dinner. 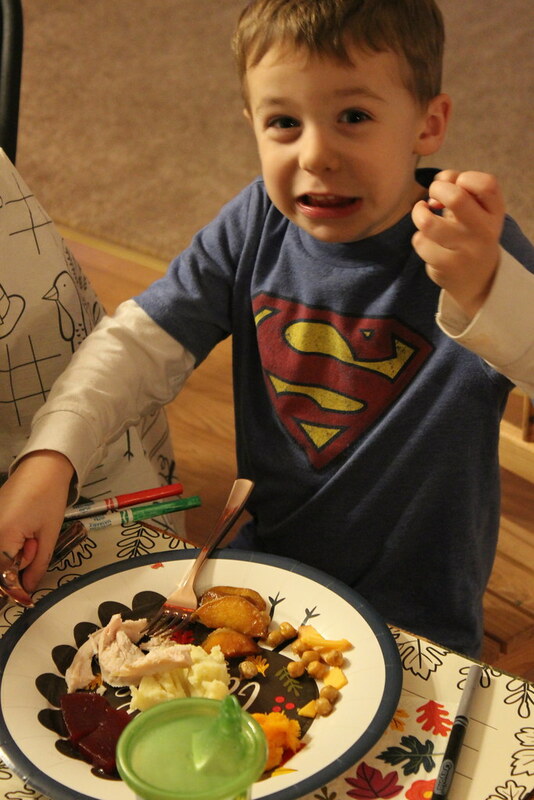 When Matt and I lived in Charlotte, family would come down to celebrate with us, and we'd all cook the dinner together. 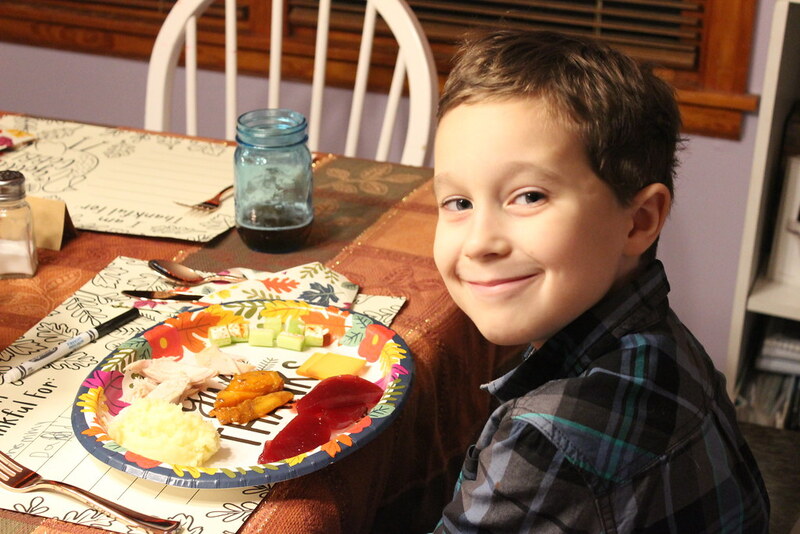 So when we moved back to Buffalo, I held onto what I learned and continued making most of the sides for Thanksgiving dinner. Even so, hosting it isn't something I've done since 2008 or so. 2007? Somewhere in the realm of a decade ago. I'd normally cook up my contributions, pack them up, and head over to my mom's house. I was up multiple times overnight, nabbing early Black Friday deals. 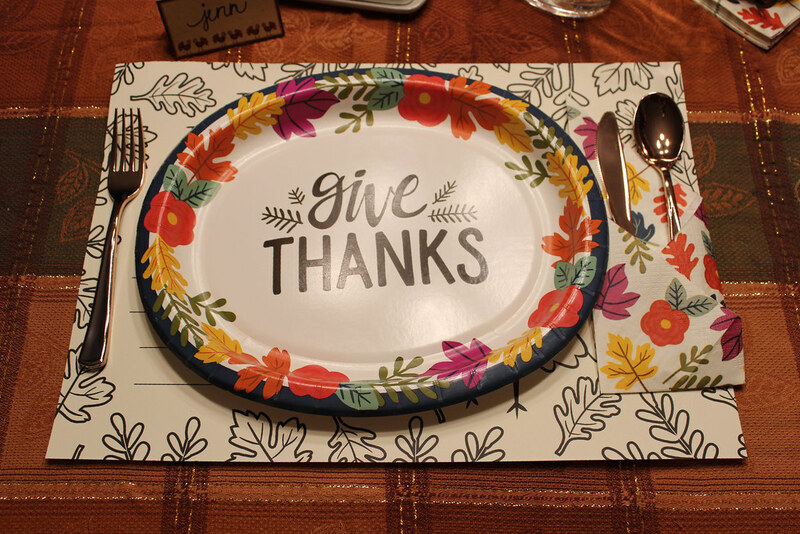 In the morning, I watched the Macy's Parade with the boys and worked on my own Black Friday sale business with Matilda Jane. It was around 10am when I got up to start cleaning, setting up, showering, and cooking...and I didn't stop until 5pm. It was crazy how non-stop the entire day was! While I finished up dinner (and getting myself ready, because aren't we always last??) I set out some pre-dinner nibbles. 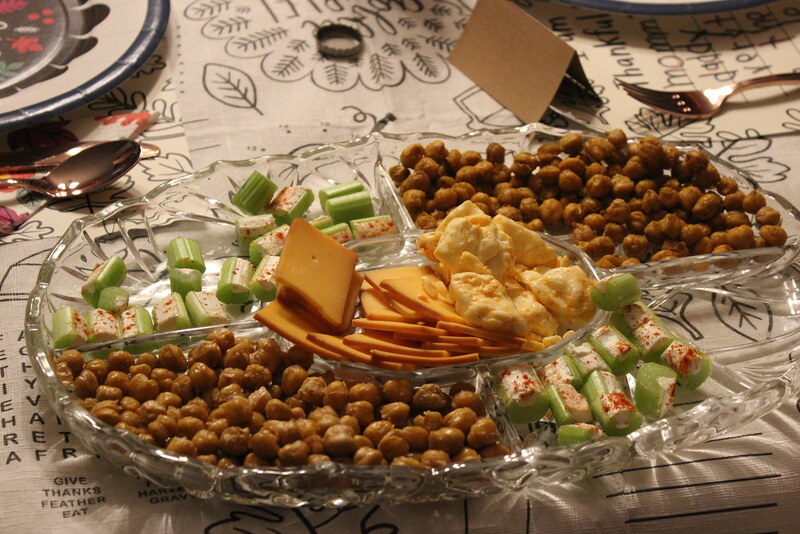 Cream Cheese Celery is a staple of our turkey day, and this year I added some roasted chick peas (some were sea salt, the others were spiced with turmeric and garam masala), and then I filled the center with some buffalo cheese curds and smoked cheddar. 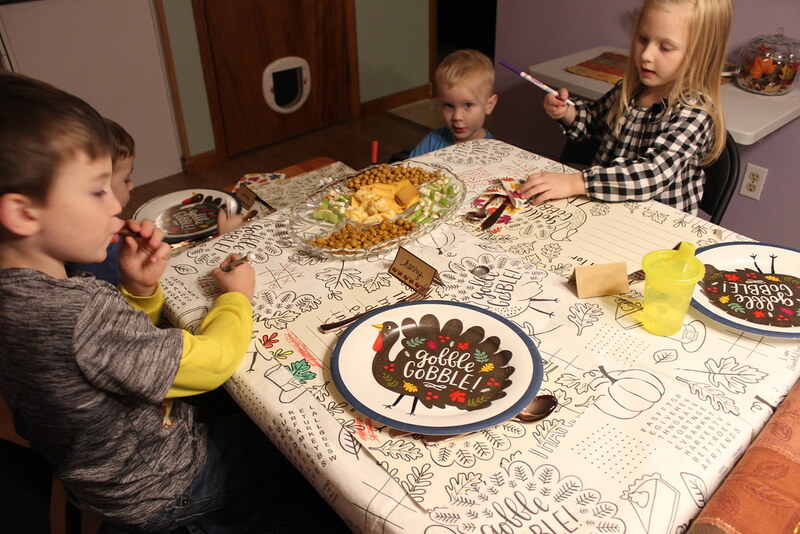 Actually the color-on tablecloth and placemats were an awesome way to keep them entertained while they all waited for us to finish cooking and fill their plates! 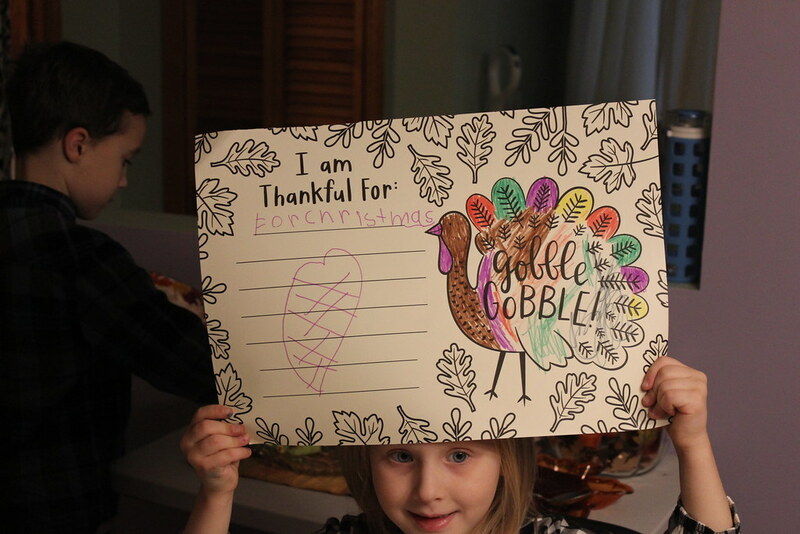 They played tic tac toe, colored in their turkeys, and the big kids even played along and wrote what they were thankful for. From this point on, I did nothing with my camera. I'm having that problem a lot lately!! 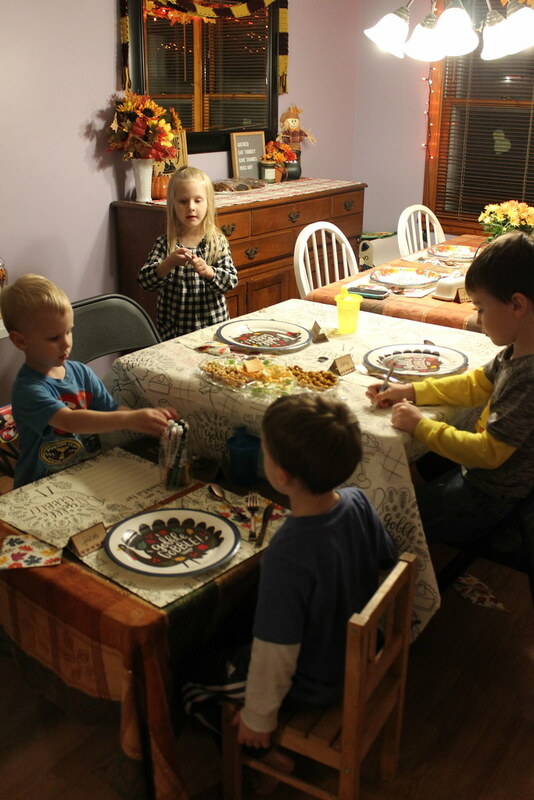 But I did manage to at least get a (not great) picture of each of my kids with their Thanksgiving plates filled! The kids played for a bit, too, as we worked out our Black Friday plans before my sister and her family left. My littlest sister came over as the kids were going to bed, and she and I watched a cheesy Hallmark Christmas movie....Christmas tree on, snuggled in blankets. She spent the night on the couch so we could get up and get right down to shopping at 5am! 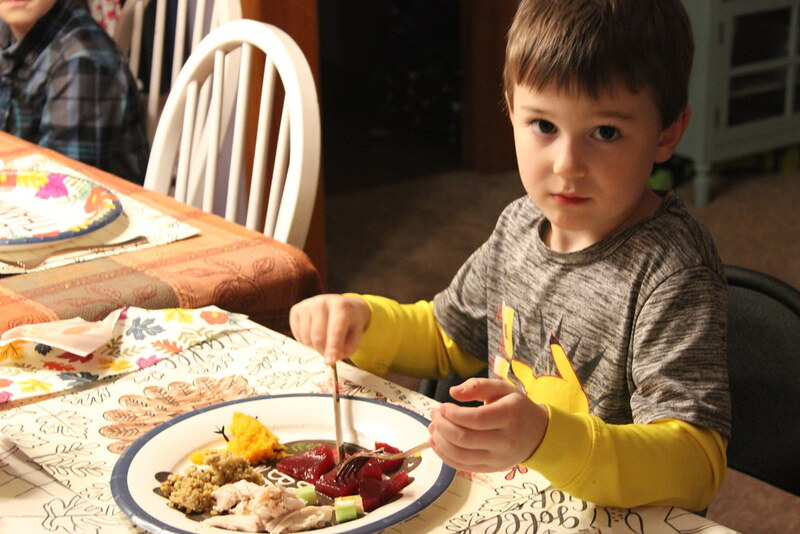 It was a whirlwind of a day, but all the regular players were there, the kids had a blast, and everything was as delicious as always! I was so tempted to get that table cloth but didn't. Very cute idea. 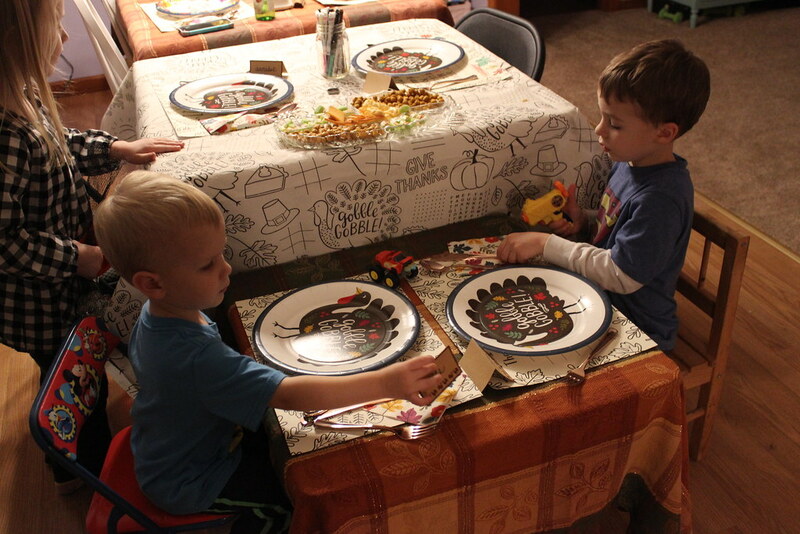 We did get place mats for the kids but for some reason, we adults have been using them. ha ha!